Oh if you have not had a Magnum Ice Cream Bar you are in for a treat. Joe and I just love the chocolate ice cream with chocolate & almond coating but we would be happy with the vanilla ice cream one as well. They do have a new Gold Magnum but unfortunately neither Joe or I like it as much. Sorry we bought these on our way home from Viviana’s and the actual ice cream bar was eaten well before we made it to the house. There are several ice cream companies in Ecuador, Pinguino, Gino’s and Topsy are the three we are familiar with. 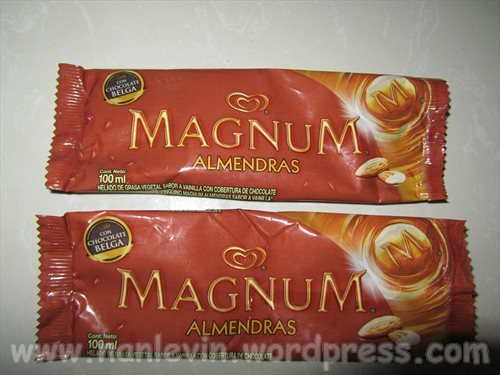 We like most of what they all sell, the big exception is the Gold Magnum, actually I don’t get it. What is it??? It is supposed to be caramel, but falls way short. I think what I like least about it is that when we bought them it meant giving up the chocolaty almond goodness that is our regular Magnum. And at $1.30 now although relatively expensive as things go here, it’s a real culinary bargain! We usually buy them just down the street from our house, and usually on our way home. We sit on the little bench in front of the store watching the traffic go by (mostly foot traffic, occasional bike or motorcycle or cuadron, and less often an actual car or truck……).It’s a tough life, but someone has to live it. 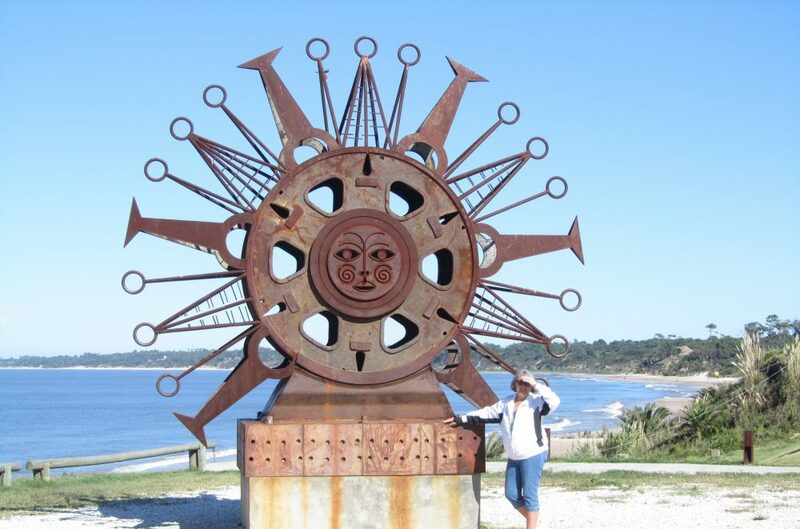 This entry was posted in Beach, Chocolate, Ecuador, San Clemente and tagged Beach living, chocolate ice cream, Ecuador, Expats, Ice cream, Magnum Ice Cream Bar, San Clemente, South American, Topsy by Nancy Levin. Bookmark the permalink. I hear ya sister! I have loved these for many years in South American countries. They really are fantastic. If you want to save $0.30, the Majestic version is very good, but a different brand. These are really as yummy as you describe here. Love em! Thanks for the reminder I dont have one right now! haha. No dill planting yet, I am SO behind on my to do list, this week finishing up stuff at Jan’s house, she’ll be back a week from Wednesday. My backs been bothering me a bit so haven’t been riding as much so been doing some crafty stuff instead, but sitting too much is not a good thing either. Thanks, I’ll accept the dill :), still have a bit that I dried but soon will be out . I had one the vanilla and chocolate with the almond the other day and it was heavenly, but I want a chocolate filled one!! In the states this would be about 2.00.